We offer a wide selection of Tirfor machines that can be utilized to lift, and pull loads over a distance depending on the wire rope length. 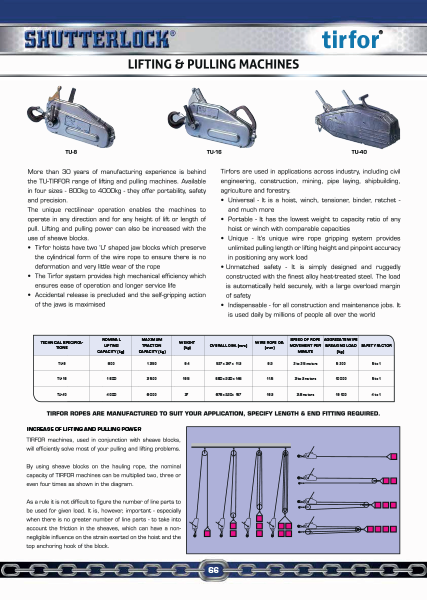 More than 30 years of manufacturing experience is behind the TU-TIRFOR range of lifting and pulling machines. Available in four sizes – 800kg to 4000kg – they offer portability, safety and precision. The unique rectilinear operation enables the machines to operate in any direction and for any height of lift or length of pull. Lifting and pulling power can also be increased with the use of sheave blocks. Tirfors are used in applications across industry, including civil engineering, construction, mining, pipe laying, shipbuilding, agriculture and forestry. TIRFOR ROPES ARE MANUFACTURED TO SUIT YOUR APPLICATION, SPECIFY LENGTH & END FITTING REQUIRED.